Ultra white plastic snap card (key tag),30 mil. 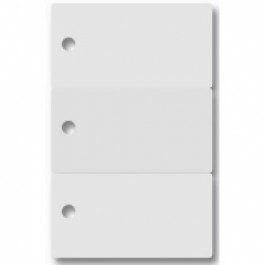 White plastic snap cards (key tag) are suitable for a full array of printing applications such as full colour edge to edge printing, colour Business card and ID type printing and monochrome print applications. These cards are standard credit card thickness and conform to ISO-7810 standards for dimensions and quality. Pre-punched holes in each tag.